Natural slate is one of the main materials used in modern construction. We have selected some examples of modern houses that show the huge potential of this natural and unique product for both roof and façade applications. Slate is the natural choice when in search for an efficient and durable material. The number of architects and home owners that opt for this natural product keeps growing. The following 6 modern projects are great examples of what can be accomplished with natural slate. Fall in love with these breath-taking houses designed by architects all over Europe. 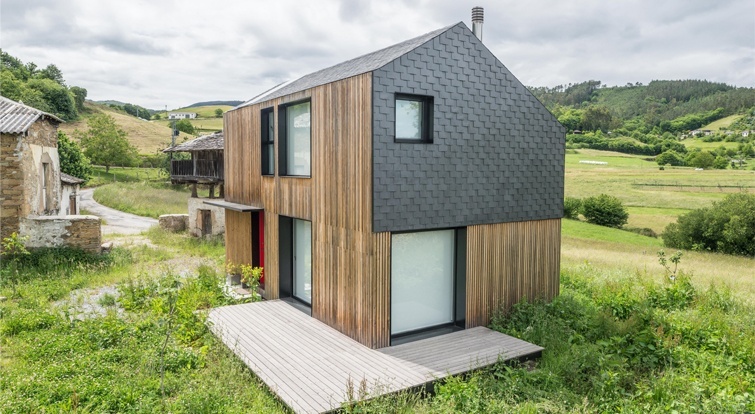 This house, located in the North of Spain, was designed by the architecture firm Duque y Zamora. This firm specializes in the Passivhaus standard, which requires them to perform an exhaustive analysis of the climatic conditions in the area. The main goal of the project was for the house to reach almost zero energy consumption. Slate was selected as the ideal material for both roof and façade due to its natural properties and extreme durability. Discover more about this bioclimatic house. The combination of wood, crystal and slate gives a modern and elegant appearance to this innovative project. 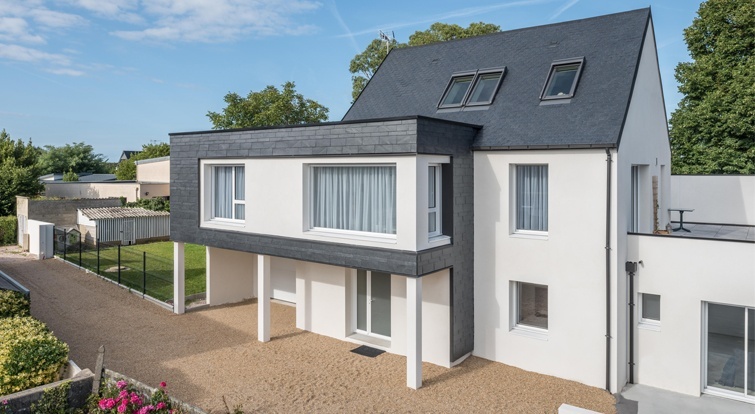 Natural slate covers both façades and roof, creating a uniform line extending from one side of the house to the other. The wooden columns are naturally integrated within the large windows on the front and back of the building. Discover all the details about this innovative slate-clad house with an ocean view. Modernity and tradition live under the same roof in this single-family home. This project follows the modular house trend of using pre-built three-dimensional modules to speed up the construction process. Nevertheless, this new construction process is not an impediment for using natural materials, which always provide a much better integration within the surrounding landscape. The result is a modular house with a simple and unique design that, at the same time, meets energy efficiency requirements and local urban regulations regarding the use of specific materials. 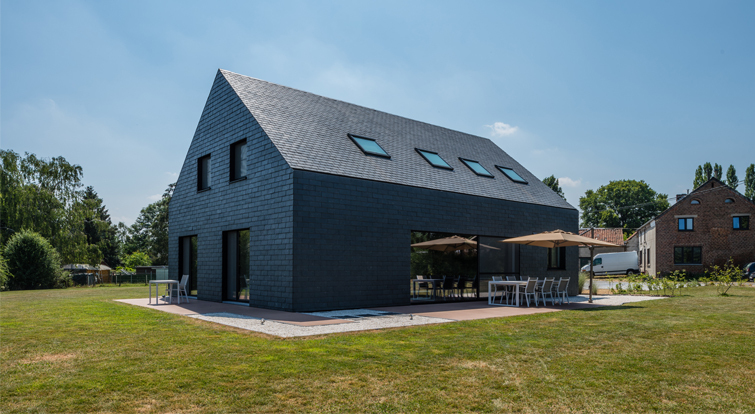 Discover the details of this modular house with slate roofing. Dating from the sixties, this house has been extended and remodelled, giving it a contemporary appearance. Its black and white design is both elegant and efficient, thanks to the use of CUPACLAD, a natural slate ventilated façade system. The architect of the project, Laure Ferrari, wanted to ensure the extension was in line with the current materials of the house. Natural slate cladding not only provided a modern look but was also easily integrated in the design, as the original roof was also made of slate. Discover more about this renovation/extension project with natural slate. 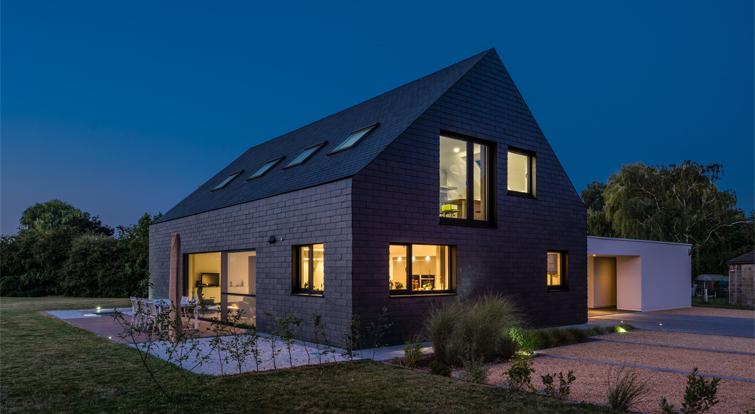 Slate protects this stunning bioclimatic house, located on the French region of Brittany, from the oceanic climate of the area. Both the pitched roof and the facades are covered with natural slate. This design is true to the traditional constructions in Brittany and provides a modern touch to the house. 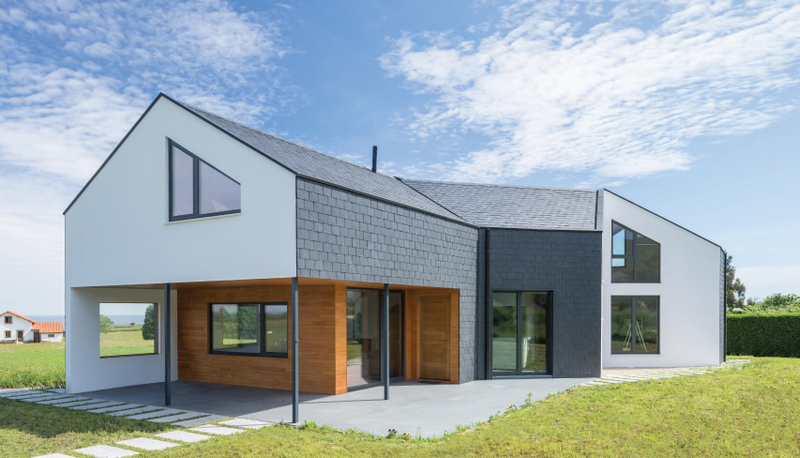 Josselin Guillo, architect, and Dorothée Martin, co-designer of the project, were inspired by single-family houses with natural slate pitched roofs that are typical of Brittany. Having that style on mind, they reinvented the design and adapted it to contemporary architectural trends. 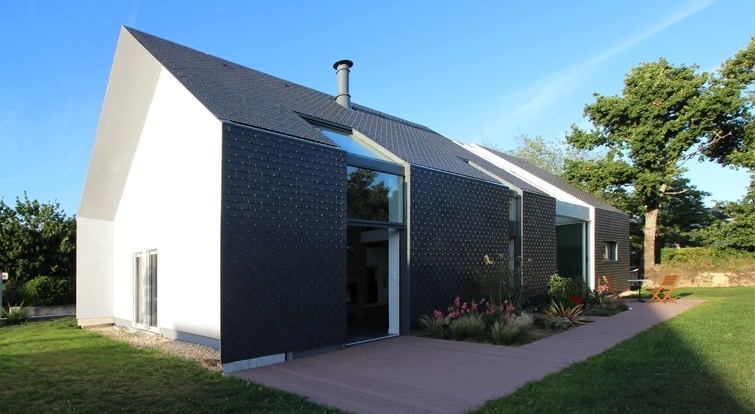 Discover more about the construction of this bioclimatic house covered with slate. This project located at Fernelmont, a small Belgian village, was a real architectural and administrative challenge. The right integration in the landscape and the use of natural materials were key elements in the design of this family house. The owners were looking for a contemporary and efficient design while keeping the locally traditional materials and structures. According to the architect of the project, Vincent Meulebrouck, the owners quickly opted for natural slate because of its mineral properties, texture and durability. 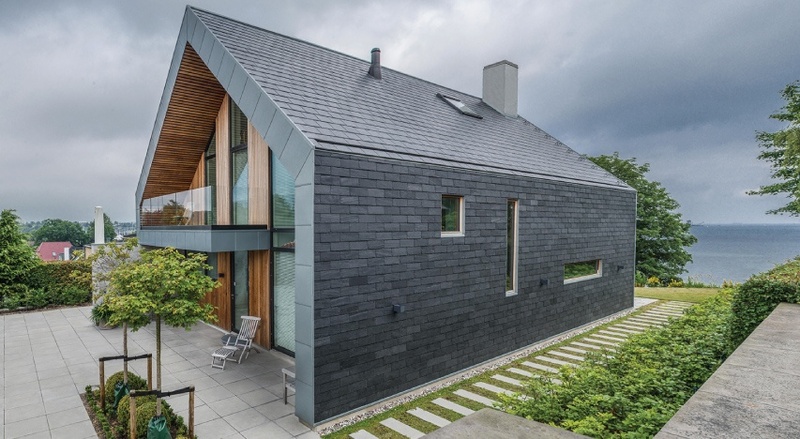 Discover everything about this contemporary slate-clad house. All these modern architectural projects show the huge potential of natural slate in contemporary architecture. Discover more about natural slate and its advantages.